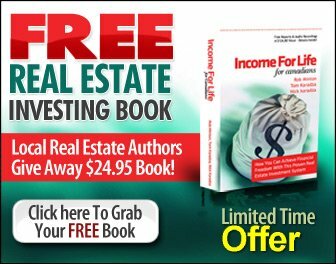 Real Estate Investing for Canadians "Adventures from The Streets!" Real estate investing for Canadians can by tricky business. This week I had some time to catch up with some old friends who are also real estate investors. There were a ton of interesting stories (with real estate investing that's pretty common!) and some good lessons learned. Let's share them here so we can all benefit. The first "lesson" comes from an investor buddy of ours who had a tenant in one of his properties for a couple of years. The tenant then moved out, the property was left in decent condition, only minor cleaning required. He placed some advertising and began making appointments to show his property to prospective tenants. He wasn't having much success because he was putting his interests ahead of the tenant's. He was getting into the fine detail of the lease agreement before the people looking at the property had even decided if they could afford the place. He wasn't putting himself in their shoes. The people coming into the property had questions about the rent, the property, the schools in the area. He was concerned with their income level, pets and how many people would be living in the property. And they could tell that he was more interested in his interests than theirs. After about six weeks of this, he figured out he had to change strategies and began taking a sincere interest in the people coming into his property. He tried to understand their situation and put himself in their shoes. He showed a genuine interest in getting to know them. He rented out the property in two weeks after changing strategies. We're extremely proud of his ability to self-correct the way he did. Awesome. Lesson -> You get what you want by helping others get what they want. Another investor we know recently renovated a property before he advertised it for rent. He couldn't rent out the property because he was so busy with other work the property began to fall to the bottom of his priority list. We decided to help him out and because the property itself was so beautiful we got distracted and didn't monitor the advertising results closely enough. Weeks went by before we realized we had made a serious mistake and adjusted our marketing. You can never take your eye off the ball. Lesson here -> Just because a property is beautiful inside it won't rent itself out. Results are the only thing that buys steaks for the BBQ. An investor we know was recently asked if dealing with rental properties was frustrating and if it was a lot of work. The person who is dealing with both gets to have more cash in his life. The investor replied that although it definitely was work and could sometimes be frustrating, "It's like I get to take a free vacation every year". Meaning that a single property pays for him to sip tequila in Cabo once a year. Lesson: Most good things in life require some work. Another investor gets asked out for lunch all the time to share his "investing know-how with friends and co-workers. The lunch typically ends with the want-to-be-investor saying the "don't have the time" for it. Most people "don't have the time" for very much. Do you think active real estate investors just have a bunch of free time to kill so they decide to buy some property? When someone tells you "they don't have time" for something, what they are really saying is, "I'm not going to do that because it's not high enough on my priority list." There's no such thing as time management, there's really only priority management. When something has a high enough priority you'll get it done. Kinda like when you get a million things done before you go on vacation. There's a deadline and you move everything to #1 priority in your life and you get it all done before you leave. Lesson: Most people don't have time for very much. If you make the time for the 20% of activities in your life that will generate 80% of your results you're likely onto something pretty big. Until next time... be a Renegade! To return from this Real Estate Investing for Canadians page to the Real Estate Investing Guide click here.